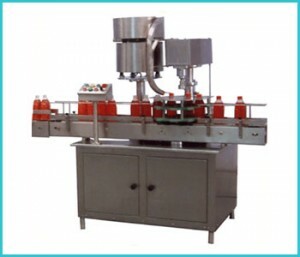 A single head automatic ROPP cap sealing machine, with S.S. belt conveyor is to be connected in line with automatic filling machine. It is also having ROPP cap orientation unit for automatic cap placement on the bottle. The basic machine has fabricated frame with S.S. claded table top esthetically encompassed by S.S. sheet and supported on height adjusting legs. The cap orientation unit & sealing unit mounted on table top individual height adjusting system. The filled bottles moving on the conveyor belt are picked up by star wheel one by one. The star wheel bring the bottle below the sealing head in the subsequent indexing in the meantime the bottle pick up a cap from the delivery chute of cap orientation unit the synchronized sealing head performs the sealing & threading on the ROPP cap. The sealed bottle is now ready for further operation. All exposed parts are of S.S.304 or hard chrome plated for Corrosion free long life. Precise centering of bottles ensured through accurate star wheel. OHNS sealing rollers for trouble free long life of rollers. Noiseless vertical movement of sealing head due to silent cam operation. The solid Hylam star plate & back guides ensure perfect holding of bottles during threading & sealing. Easy height adjustment of sealing unit and cap orientation unit.